This open-world environment game starring, yes, zombie goats is a fun, weird, and exceptionally unconventional experience. I’ve played some stupid games in my time, but GoatZ, a follow up to the odd PC breakout hit Goat Simulator that has you run around as a goat and cause chaos, may take the top spot. Come on, it’s an open world environment game starring goats—but not just any goats. Zombie goats. 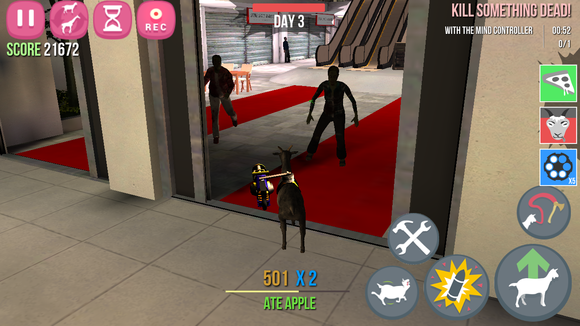 Your goal as a zombie goat isn’t just to survive, but to inflict as much damage as possible in your quest to eat brains. Yet the weirdness of it all somehow makes it fun to play, so I’ve embraced this silly game and am all in. Here are three more reasons why you should give it a chance, too. Sometimes your headbutt is the best weapon. Easily the most satisfying. 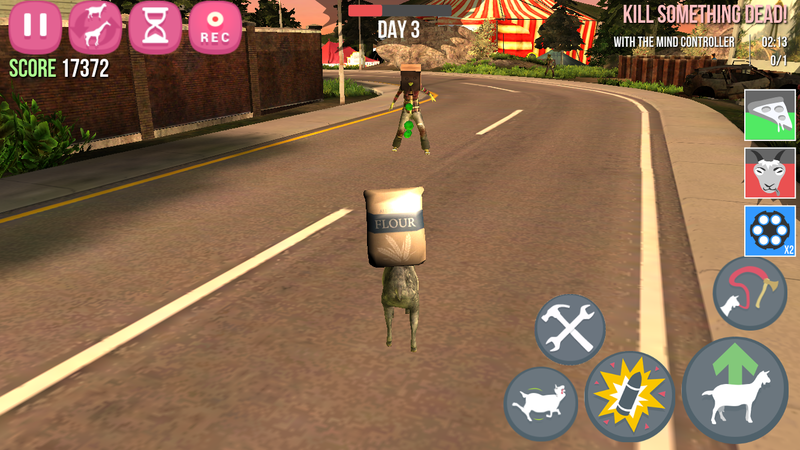 Humor as subtle as a headbutt: The major selling point of GoatZ is its filthy/immature/dark humor. If you don’t find launching flour bags at zombies and getting points for licking cars to be funny, then maybe this isn’t your game. Even its name is a reference to a particularly appalling Internet meme which I won’t link to because I like my job. More than anything, GoatZ is a satire of survival horror games (DayZ, Resident Evil, etc) and in keeping with this spirit, it has bizarre quests, weird crafting elements, and bugs galore. The 3D world is full of clipping and physics issues—but, unlike with the original title, these bugs seem to be actually partly intentional (and in keeping with various survival games’ bug-laden tendencies). The result is chaotic, but unlike the original Goat Simulator, that chaos seems to have more of a purpose. My name is Goat and this is my gun. There are many like it, but this is mine. 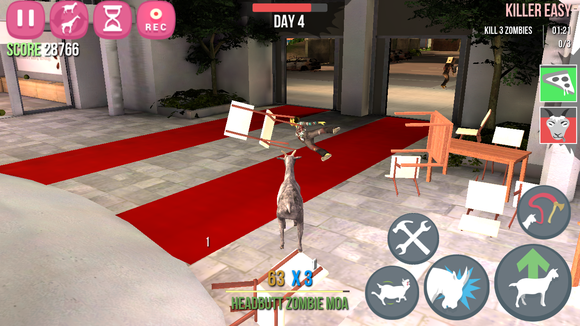 Chaotic action: In the apocalyptic mayhem, your zombie goat has a range of moves to deploy on the living and undead population. These include kicks, licks, and headbutts. GoatZ, like its predecessor, uses a combo system reminiscent of Tony Hawk Pro Skater, so you’ll get combo multipliers for linking ridiculous moves like head-butting a character and then getting your tongue stuck to a supply crate. But your moves all have a purpose: to survive. You’re not just a victim, either: you need brains to keep your undead existence continuing. 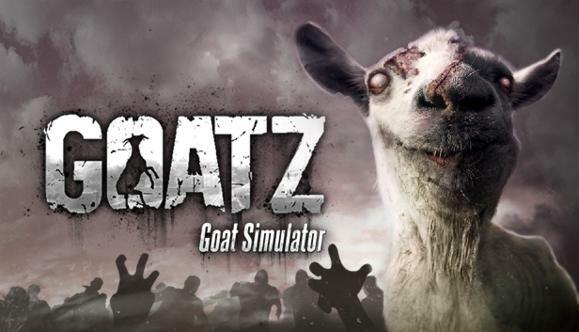 Going on killing sprees of the undead is your best chance to be the last goat standing. 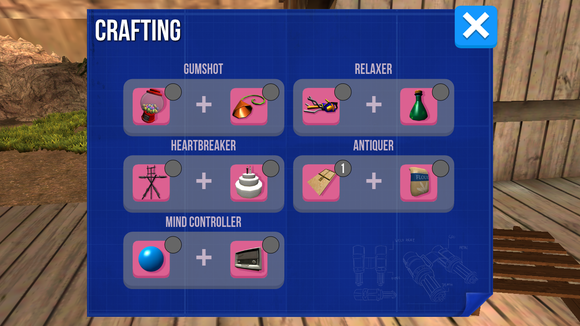 Of course, the best way to get combos and to mow down the most zombies is through crafting special weapons. This spitting zombie has no idea what’s about to hit him. The best arsenal on the farm: In a not-subtle nod to survival horror game’s tendency to make you collect and craft items, GoatZ tasks you with finding various rudimentary objects: ousetraps, cakes, gumballs, et al., and then crafting a ridiculous weapon. Or, you can simply find these and other power-ups lying around in supply crates. Your goat Macgyver has access to makeshift rocket launchers, gatling guns, and mind control devices to use against the living and dead. They’re ridiculous and overpowered, but are also essential for a longer survival. Craft items like the “Antiquer” with basic goods like mouse traps and flour. By most conventional gaming metrics, GoatZ shouldn’t be recommendable. It’s buggy, the missions are random, and they don’t build to anything. The three modes (tutorial, free play, and the main game) don’t offer a lot of replay value (even if you can unlock different “goats” through play). Oh, and the controls are pretty sloppy. But it’s a fun, weird, and exceptionally unconventional experience. There’s a reason why the game’s designers allow you to record and share specific highlights: GoatZ sets up the player for a variety of slapstick situations and gives you the tools to make them epic.